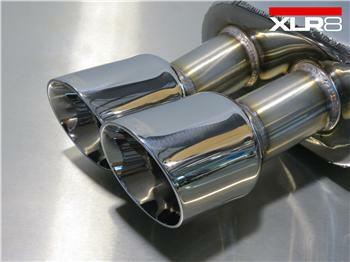 XLR8 Exhaust Systems ACURA - Excelerate Performance - European, Exotic and Japanese Performance Specialists!! Click For More Info 2004 - 2008 TL ALL ALL ALL ALL ALL ALL Single tip design for base TL but also fits TL-S.
Click For More Info 2007 - 2008 TL TYPE-S V6 3.5 N J35A8 GAS Can fit the base TL if using the TL-S rear bumper. XLR8 Performance Exhaust System are designed for function, form and style. Each exhaust system starts with T-304 stainless steel, known throughout the industry as the highest quality material practical for after-cat exhaust applications. All exhaust tubing is mandrel bent on sophisticated CNC machinery for a precise fit and uninterrupted exhaust flow. What’s more, the use of T-304 stainless steel flanges offers high strength and complete resistance to harsh elements. All hangers, resonators, and tips are T-304 stainless steel as well. The mufflers used are built specifically for each system and are designed in accord with years of racing and street development invested into the design. Each muffler is tuned to match its application for the best possible performance gain and sound quality combination. Each muffler is polished to a high gloss beautiful finish; the rest of the stainless steel system is finished in a natural satin finish.